Discussion in 'The Pub' started by jpervin, Dec 7, 2016. Frankee, Stu Cats, VCuomo and 6 others like this. jpervin and Outlaw like this. I love me some barnyard pimp. Frankee, derekd, aynirar27 and 1 other person like this. Me: This chicken is undercooked. Me: I think the vet could save it if we took it right now. Mngwa, Frankee, 84superchamp and 11 others like this. Is loving Popeye's a bannable offense around here? Not as far as I'm concerned. I like Popeye's spicy fried chicken. gwayne, Frankee, recto-robbie and 2 others like this. Best I've ever had is Gus's Fried Chicken in Memphis. I read recently that they are franchising in other parts of the country. I recently ate perhaps the fried chicken I have ever had at Smithfield's Chicken and BBQ in Morehead City, NC. I'd pay double to have some more right now! Fried chicken is messy to eat. Too messy. Not worth it. jpervin, JeffK and Outlaw like this. Outlaw and jamess like this. Kitchen smells like fried chicken for days after. Outlaw and jpervin like this. Nurk2 and Outlaw like this. No fried chicken for me, thanks. Or how about some nice liver and onions? 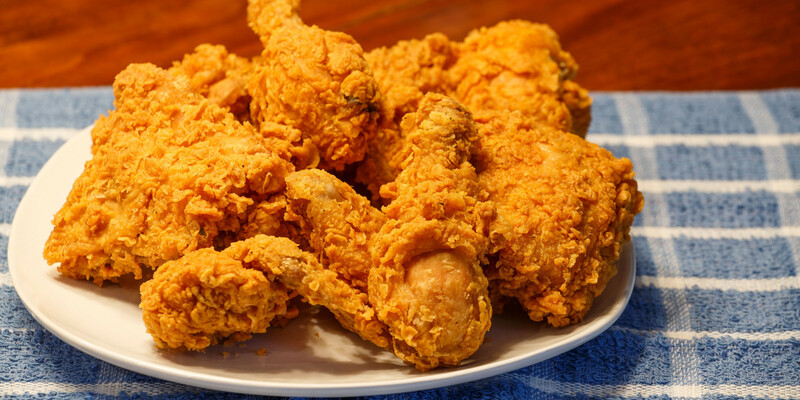 Most fried chicken is brownish and bumpy, That's not attractive on food. 100JH, AdrenalinJunkie, jpervin and 2 others like this. You've already got one in the KFC bucket, don't you?